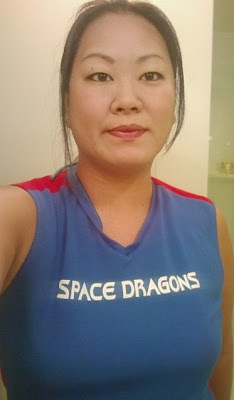 Space Dragons Dragon Boat Racing Team: Paddler Spotlight - Esther! I exercise!! Mostly at the gym, but I also do midnight runs at the beach. Is dating a hobby? jk haha I like watching & playing football with my cousins. Love watching sports and doing anything outdoorsy. Stick with it, it only gets better! I want us to be AWESOMER next year! I love the team just as it is. Hahaha the cougars crack me up! We know who we are lol and YES! Apparently, I am a cougar to 18 yr old boys! & I think Wade is just awesome. Who got you into Space Dragons/Dragon boating and How did you meet him/her? Any additional questions you want to answer?